Spring shoes are in the stores and as always there are some to lust over. Nudes, Brights ,metallics peep toe and wedges to name a few. Weaponed heels have even been shown in Chanel's 2011 collection. Lagerfeld shown using the gun-heeled shoe as a weapon could be more than a weapon of style. One of my favorite lust sites, Net-a-porter released new weekly shoe launches including this amazing pair from Brian Atwood for $595. 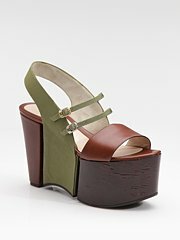 Bring these Fendi platforms home! One thing is for sure.. sky is the limit for shoes in 2011 and the higher the better. We are seeing a lot of platforms whether it be wedges or pumps. We have all been there with Jennifer Lopez made a bandaid spotting at this years Grammys. New stats came out today from our friends at Shopsmart.com came out with these poll results on the PrivyDoll's favorite things, shoes! How do you match up?
" -For everyday footwear, women prefer flats as 39 percent of women indicate that it is the preferred heel height. Only 8 percent of women wear heels over 2 ½ inches on a regular basis. -Despite a preference for flats, one quarter have worn heels 4” or higher on at least one occasion. -Forty-six percent of women have bought an ugly pair for comfort, but more women are willing to tolerate pain for fashion—60% vs.49%—than they were in 2007.Women take precautions for the pain as 61 percent have carried a second pair of shoes to a party or event to change into. -Forty-eight percent have had a shoe-related injury (blister, break, sprain, etc. ).Thirty-five percent of women had an evening ruined by an uncomfortable pair of shoes. -Nearly one-fifth (19%) have gone shoe shopping to cheer themselves up. -Although the majority of women (86%) are up front with their spouse or significant other about their shoe purchase, 14% admit to hiding at least one purchase. -Over one quarter (28%) feel shoes are an important part of their outfit indicating that they put a lot of thought into selecting them each day. Plus over half of women (51%) typically notice shoes other people are wearing."